Our Bible Study is on Wednesday at 6:30pm. Call in! In 2014, Bethel African Methodist Episcopal Church celebrated 90 years in the City of Monrovia. We have a long rich history in Monrovia. Bethel has always been a active part of the Monrovia community. With great leadership the church has been able to offer assistance to seniors and youth in the community. It is our desire to continue to be a vital part of the community. To that end we have created a non profit organization, Impact Southern California CDC to "engage entrepreneurs and other business owners and to expand capacity and create employment opportunities that transform communities and lives." The Pioneer Church colors were royal purple, pure white and true blue. In 1919 and 1920 there were many citizens of the city of Monrovia who were members of the AME Church of Duarte, California. Because of the intolerable situation regarding means of transportation at that time, these good people decided to establish a church in Monrovia. It was suggested by the Rev. Simpson the pastor of Duarte, that this move would be advisable. Thus the withdrawal was one of harmony and good will. The first meeting to organize a church was held in the home of the late Mr. and Mrs. J.H. Bonner on Cypress Street. Meetings were held from place to pace and there services were held regularly. The members of the church were: Mrs. Anna green, the mother of Anna Fisher, L. Charlton, Laura Jones, Ms. Amanda Powell, Mary B. Hanford, Eugenia Steward, Mr. and Mrs. Clay Hawkins, Mr. and Mrs. Sherars, Mr. and Mrs. Lewis Williams, Mrs. Florence Prince, Mrs. Pope, Mrs. Paulette, Mrs. Buckner, and Rev. Prince-Pastor. The financial struggle of the church was difficult, mentioned only to express the sacrifices that were made for the promotion of the cause. 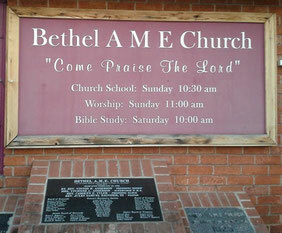 The church property was purchased October 26, 1925 from Mr. and Mrs. William Mauer and Deeded to Bethel AME Church. The first trustees executed a $550 loan to pay for some lumber so we could get out of the tent with the dirt floor. This money was repaid in October, 1928. The main part of the building was constructed in September 1928. An additional $500 was obtained to pay up some indebtedness and other necessities. Second Baptist Church was so kind and helpful to Bethel hosting our first big rally. Mr. and Mrs. Hawkins paid $300 in the rally. Second Baptist Church gave us our first Communion set and we were grateful. Such few colored people lived here that didn’t want another church, Bethel made the third colored church in town and there sure was talk about it, but thank God kept moving on. There was a God sent man Lt. W. Robinson who was made head Trustee. Every penny was accounted for. Bethe did not have very good seats to sit on, but our pastor would beg and bring in what we could find. The lovely pulpit set was bought by Sis. Ruth Wright, in honor of her mother. Our great history includes moving to a worship location on Duarte Road predicated by the redevelopment project for Huntington Boulevard. The City Council decided to redevelop the city to include new businesses that required larger plots. Pastor Redmon purchased the church on Duarte Road. Pastor Jules Bagneris III moved the church to its’ current location on the corner of Primose Street and Lime Avenue, Monrovia. "The African Methodist Episcopal Church has a unique and glorious history. It was unique in that it is the first major religious denomination in the Western World that had its origin over sociological and theological beliefs and differences. It rejected the negative theological interpretations which rendered persons of African descent second class citizens." "God Our Father, Christ Our Redeemer, the Holy Spirit Our Comforter, Humankind Our Family."